Fired US TV news anchor Matt Lauer has said he is “truly sorry” after being accused of sexual misconduct. He was the co-host of NBC’s flagship Today programme for two decades, but that came to an end this week. NBC sacked him on Wednesday after receiving a “detailed complaint” from a colleague. On Thursday, the network said two more women had come forward. Lauer said that while some stories were untrue, there was “enough truth” to make him “embarrassed and ashamed”. 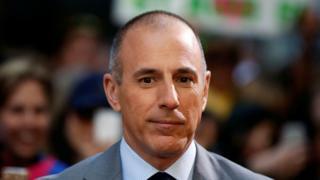 In his first statement since the allegations came to light, Lauer said: “There are no words to express my sorrow and regret for the pain I have caused others by words and actions. “To the people I have hurt, I am truly sorry. As I am writing this, I realise the depth of the damage and disappointment I have left behind at home and at NBC. He said “repairing the damage will take a lot of time and soul searching”, adding: “I’m committed to beginning that effort. It is now my full-time job. NBC fired him two days after receiving a complaint of “inappropriate sexual behaviour in the workplace”. Two more women have since come forward with allegations, which have been published in Variety and the New York Times. Variety, citing unnamed sources, reported that Lauer allegedly exposed himself to a female employee, invited multiple female staff members to his hotel room while on assignment and had a button installed beneath his desk that allowed him to lock his door without getting up. Lauer was one of the network’s biggest stars and signed a new contract with the network worth a reported $20m (£15m) per year in 2016. As well as fronting the morning show, he was chosen to moderate an election debate between Donald Trump and Hillary Clinton in 2016. And he has conducted high-profile interviews, such as the one in which Charlie Sheen confirmed he is living with HIV in 2015.